The Atacama desert is small compared to other deserts, but it's still quite large compared to a city. 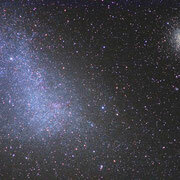 So, where are the best locations to see the stars, considering also the need to have good roads to reach them? Here is a list of the places I discovered, in order of sky darkness. All these locations can be reached with a normal car, or a small bus. After driving through the Atacama desert for more than 20000 km (!) 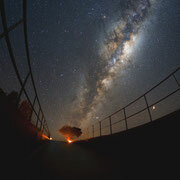 this is without doubt the best place to observe the night sky. 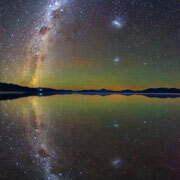 Not only the best for the Atacama, but the best in the world. 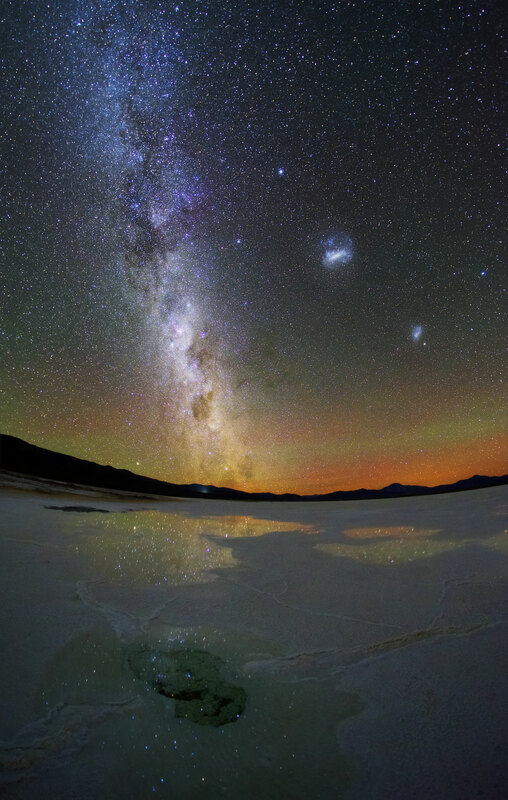 The Salar de Maricunga is a salty lake and a salty lagoon located at 3750 meters above the sea level, 2 hours driving from Copiapó, the capital of Atacama region. The road is in good shape, made with a special salt very similar to asphalt. Just before reaching the salar, there is a check point of the international police, because the road will follow until Argentina (more than 100 km away though). 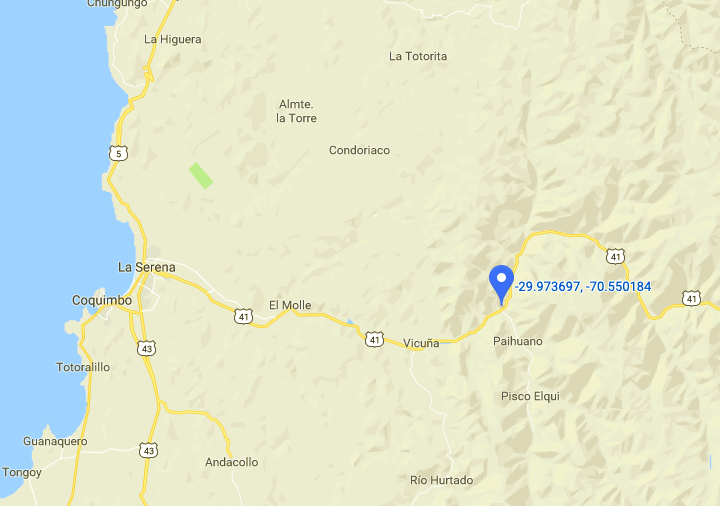 If you don't want to go to Argentina, you can just skip the custom control by entering to a secondary way on the left where there is a Carabineros station. 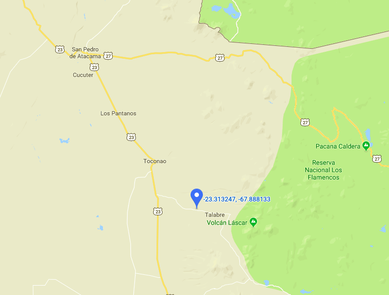 You park just in front the "gate" made with a simple chain, knock the door on the small house on the left and just inform a Carabinero about what you want to do (make astronomical observations near the salar). He will say to you to open the gate and pass and for the return, if it's very late, you will just leave one stone in front of his door just to announce that you come back safe and safety. After the checkpoint, the road will improve a lot and you will soon find some small path to the right that will bring you closer to the lagoon. These are unsealed roads but in good conditions. Be careful to not go too close to the salty lake and stay in the path. During the day there is always a strong wind, a constant of the plateau. In the night, usually, the wind calm down and often will stop completely (unless there is a perturbation close to your location). Of course the temperatures are very low. During the summer, in the night, they are around 0°C. During the winter they can fall down to -15°C or lower. My advice is to go on summer or early autumn. Be careful to the high altitude: some people will suffer because the lack of oxygen. Not suitable for children or old persons, or to any person with lung problems. 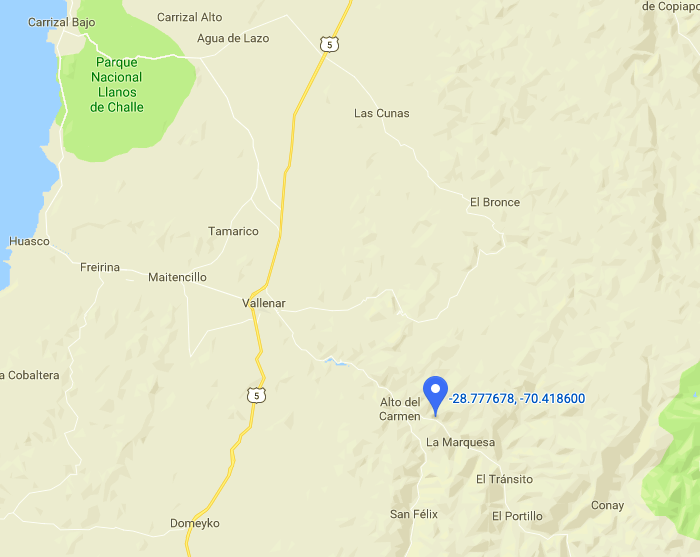 Since it is located in the Cordigliera de Los Andes, the weather conditions are not as steady as the ones in the desert, so it's better to check in advance their status. 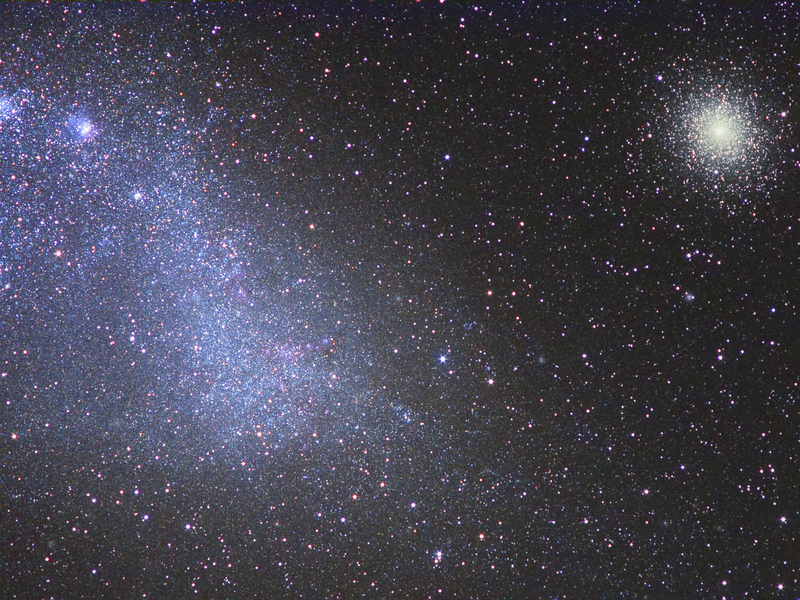 Anyway, there are more than 250 clear nights per years. 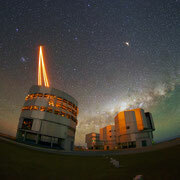 mean SQM at zenit without the Milky Way: 22.05. Maximum darkness reached: 22.17: this is one of the best values reached in the whole world. 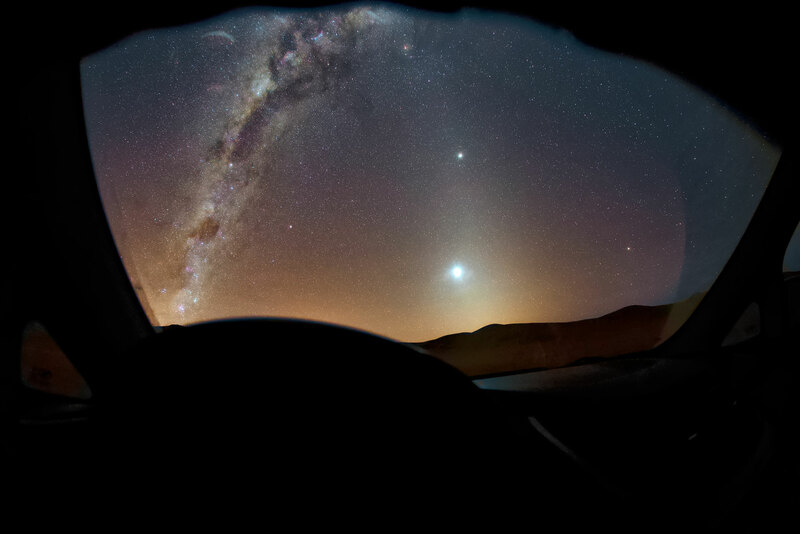 Considering the high transparency and low humidity, this is probably the best dark sky in the world, at least the best dark sky that we can reach in a normal car. Humidity: < 20%. Light pollutions almost absent in any direction. Only local faint lights. 4) Presence of Carabineros 24/7 at few kilometres, in case on an emergency. 6) Amazing panorama, with the blue water of the lagoon and the white salty floor. 2) The lagoon is beautiful, but be careful. The salty floor can be thin so it's better to don't go to explore the lake alone. There is no much to say about it because the name already says it all. 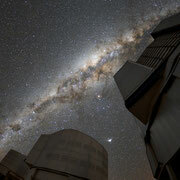 The ESO Paranal VLT observatory is located in one of the best places of the Atacama desert, with one of the best skies. 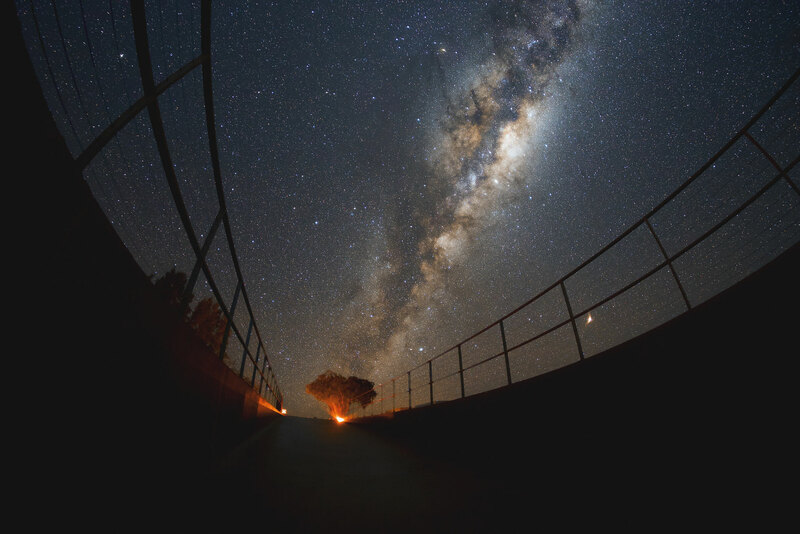 There is only a small problem: unless you are working at the observatory or you gained observing time as astronomer, NO ONE will let you stay there during the night. But, of course, you can stay around: we are in the desert, there is plenty of space! 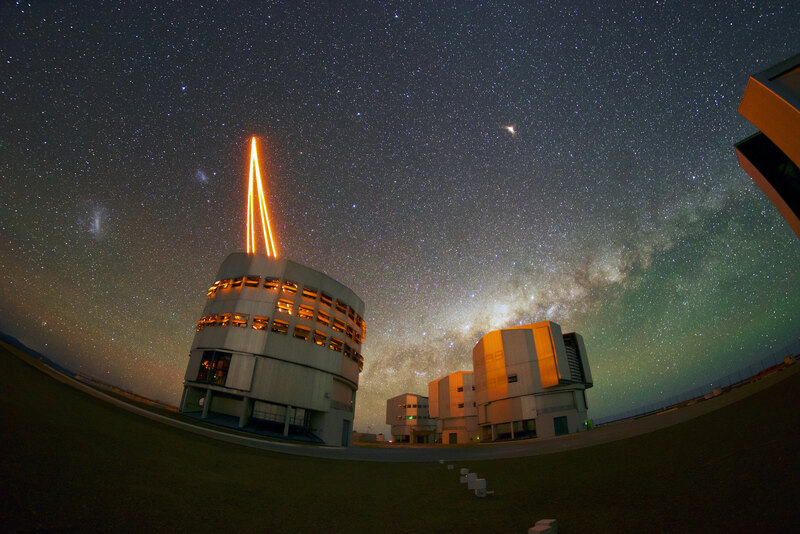 Paranal is located in the heart of the Atacama desert, 130 km south of the city of Antofagasta and 400 km north of Copiapó, the capital of Atacama region. Reaching the observatory is very easy because the road is in perfect conditions. From north (Antofagasta) or south (Copiapó) you also will see an amazing panorama, feeling like you were on Mars (literally!). 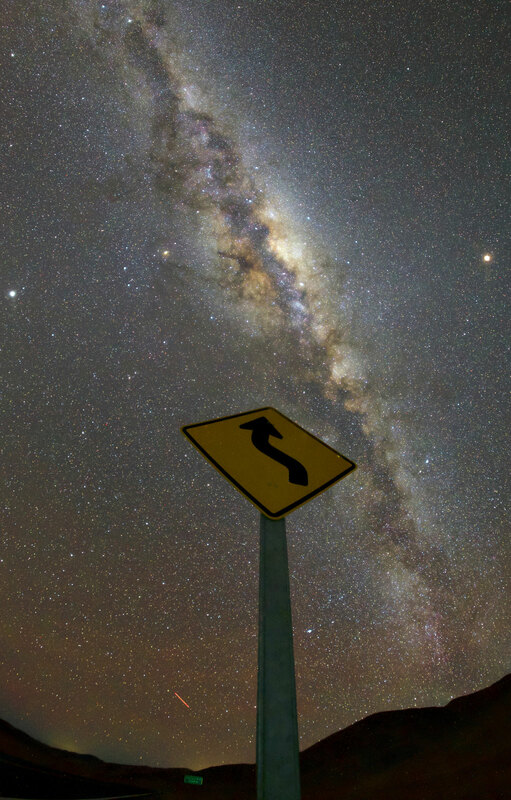 Unfortunately the region around the Observatory doesn't have hotels or fuel, so plan your trip carefully because the nearest spot is Antofagasta or, with a little courage, the town od Taltal, about 80 km south. You will not have access to the observatory road, especially during the night, but you could stay around. Along the main road there is plenty of space to park and enjoy stunning observations. We are in the middle of the desert, so the weather is very steady with about 330 clear days per year. Be careful tough to the wind. This part of the desert, close to the ocean, is generally very windy, even during the night. It's very difficult to find a night without wind, but most of the times we are under 20 km/h. 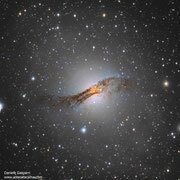 Anyway, if you are planning to to deep sky photography with a telescope, you should take seriously the wind issue. One of the best in the world, similar to salar de Maricunga. The lower altitude (more than 1000 meters lower than Maricunga) reduces a little the transparency, but it's difficult to see the difference for an untrained eye. Humidity virtually absent. Light pollution almost absent. 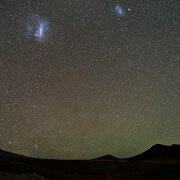 It's visible only a small glow due to Antofagasta to the north. Seeing generally is very good at VLT observatory but in the accessible sites, in a valley surrounded by mountains, could be much worst. 5) Mid altitude observing site: no oxygen problems. 3) You will be completely alone in the desert: no cell phone signal, no fuel, no hotels, no life for tens of kilometres, so take all the precautions to solve all the problems that could raise during your expedition. 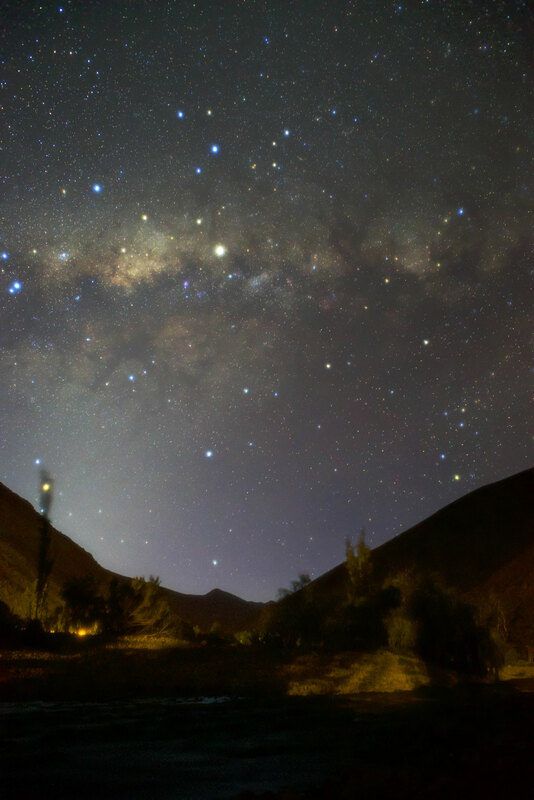 The southern part of the Atacama desert is less known but is also less populated and with less mines, the largest source os light pollution. 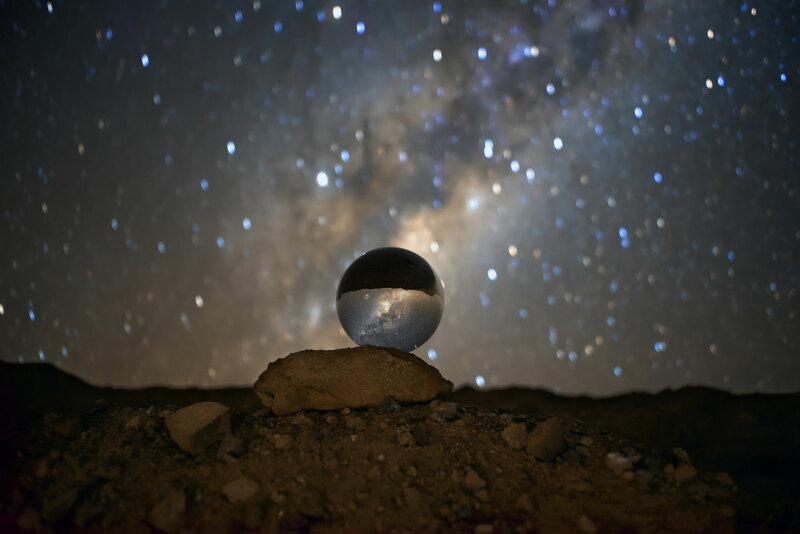 The surroundings of Copiapó, the capital of Atacama region, represent the best compromise between sky quality and proximity to the civilisation. Just 15 km from the city the sky at zenit reach a SQM of 21.50, but of course we want more, so we need to go a little further away, at least 60 km from the city. There is just one important advice: stay above the magic elevation of 1500 meters. Below this point you will find humidity and often, during the night, low altitude clouds. 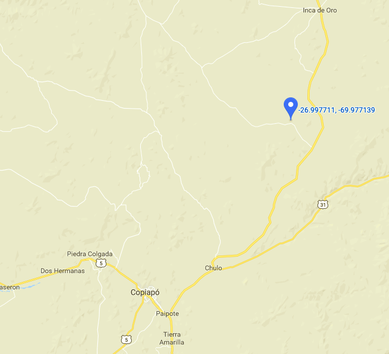 The best place that I found around Copiapó is located 70 km to the north, at 1800 meters of altitude. Don't worry, you will not even notice the altitude since you will always remain in a large valley, surrounded by small mountains (small but higher than 2500 meters). The best spot is located to the road that goes to a town called Flamenco. 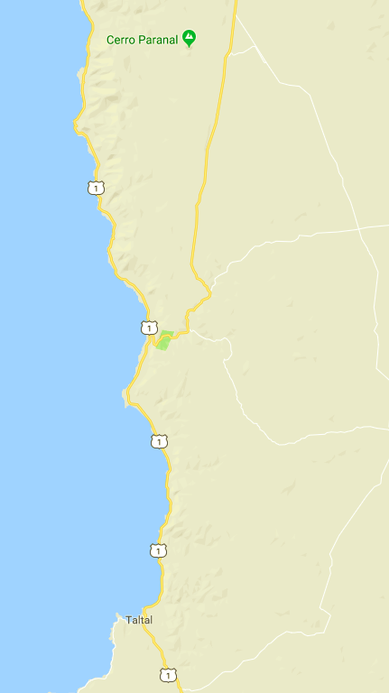 From Copiapó, you take the road to Inca de Oro for about 60 km. Then you will find two huge solar plants on the right (impossible to not see) and just when you have the first one on the right, you will find a deviation to Flamenco, on the left. The road remains sealed and in good conditions. Drive few kilometres, just to not see the solar plants because in the night there are few lights there, and then find a spot to park. Along the main road you will find at least an unsealed path on the right where you can stop safety, far from the road. The weather is steady and clear for more than 320 days per year. The wind is almost always absent from the sunset to the first part of the night. From around 1 AM a light breeze starts, always coming from the east. Humidity is absent for large part of the year. Seeing is very good, if we stay on top of the road, usually around 0.5". 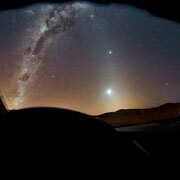 We are 70 km from Copiapó, so in the south, low on the horizon, you will see the glow of the city. 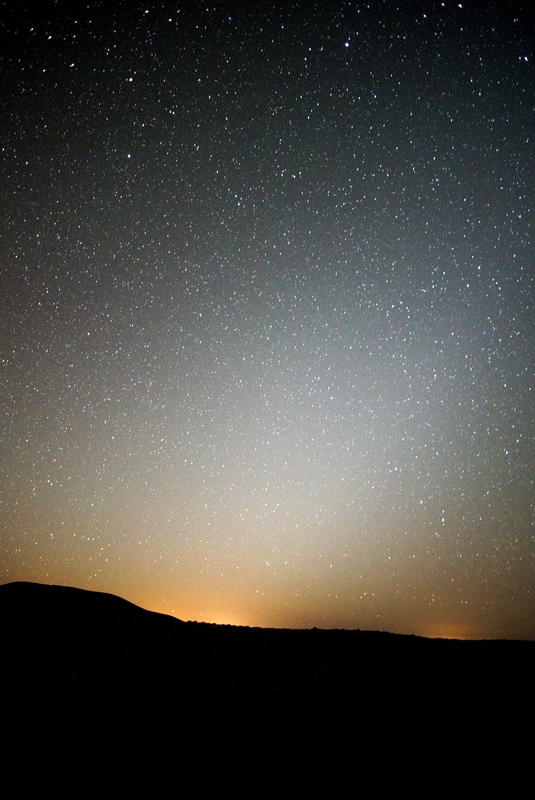 On the west horizon you also will notice, very faint, the glow of Caldera, a city on the coast. There is also a small spot in the north horizon for a couple of degrees. 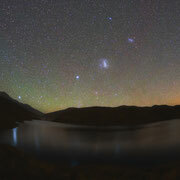 Despite these faint sources, the sky is very good, with an SQM of 21.93, with a peak of 21.95. Considering that we are just 45 minutes from the city, this is an excellent compromise. 3) The main road has a bit of traffic during the night (one car every 10 minutes), so you need to go to a spot where you don't see the road. During the week-ends there are no problems, since no one will pass to the road. 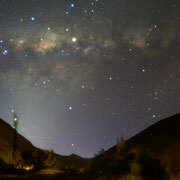 Valle del Elqui and Valle del Transito are the most known and touristic places of the Atacama desert. 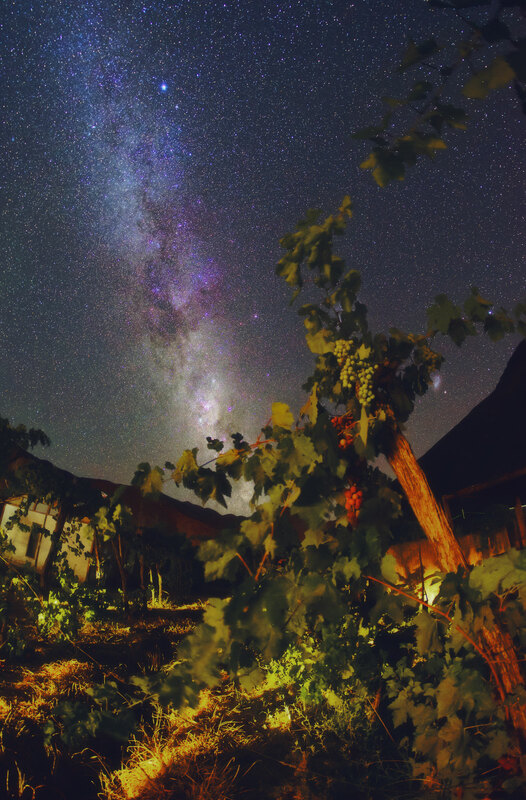 They are famous for a very good sky, good hotels (especially Valle del Elqui) and all the services you need for relaxing and safe holidays (including telephone service with 4G internet). The valleys are green, with water, trees, cultivated lands, just like a normal place outside the Atacama desert. Indeed, you will hardly notice to be in the driest desert of the world. This could be a good or a bad point. Valle del Transito is in the southern border of the Atacama region. It is a green valley but much less touristic than Valle del Elqui. There are less hotels and nature is a little bit wilder. 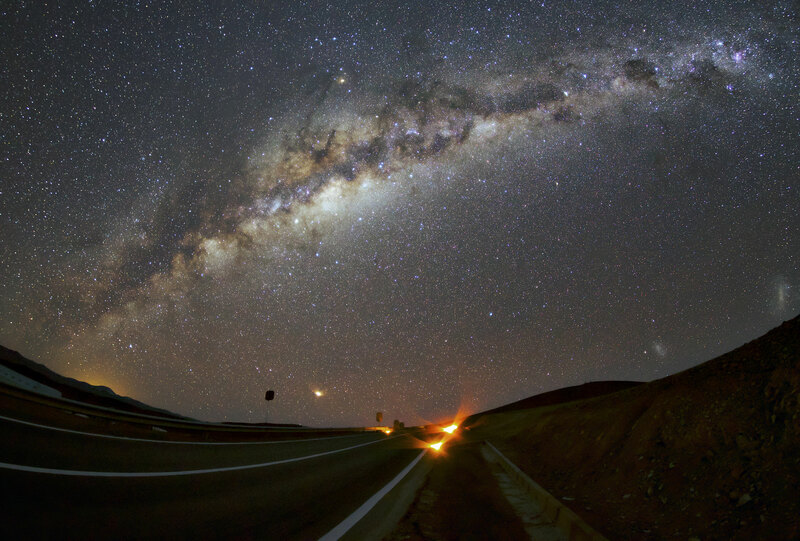 It is located west to the city of Vallenar, 170 km south of Copiapó. 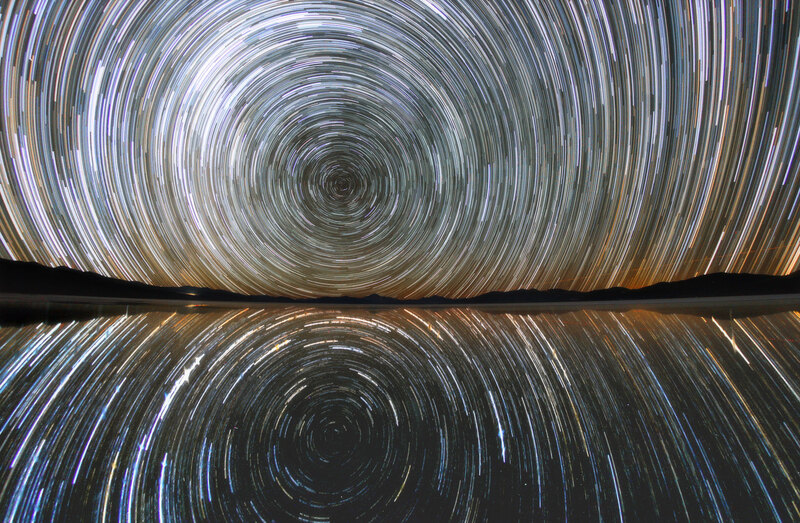 The good skies start from the Embalse Santa Juana, a large artificial lake where during the night the stars are reflecting. 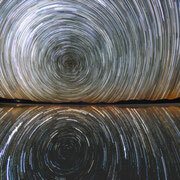 This is a good location for night sky landscape pictures, especially the west end of the lake. 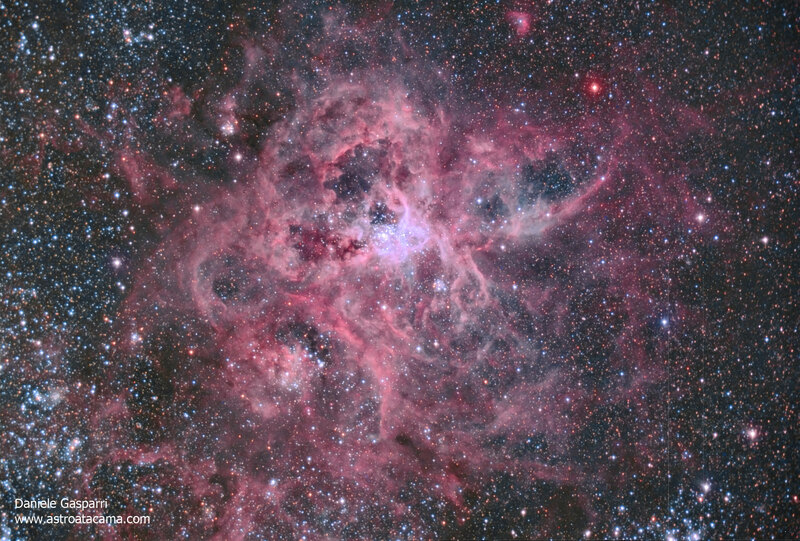 From this point on, every spot is fascinating and good for excellent wide field pictures. Valle del Elqui is very similar but more touristic. 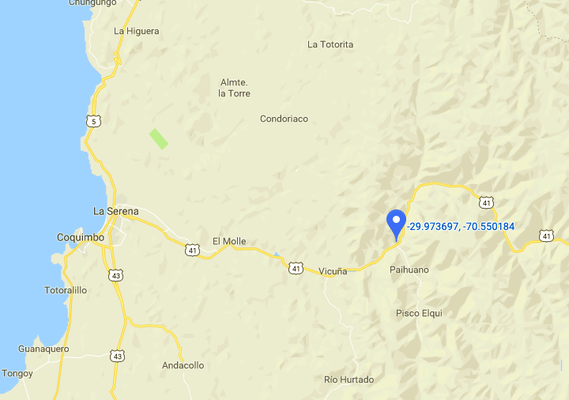 It is located about 200 km southern the Valle del Transito. The main access is from the city of La Serena, just on the southern border of the desert. The small town of Pisco Elqui is a small jewel in the middle of the (pre)desert, a perfect spot to have an accommodation and to observe by just open the window of your room! Like any other valley on Earth, weather conditions are a bit particular. First of all, there is humidity, not much but sufficient to create dew in the second part of the night. The wind is usually very low. 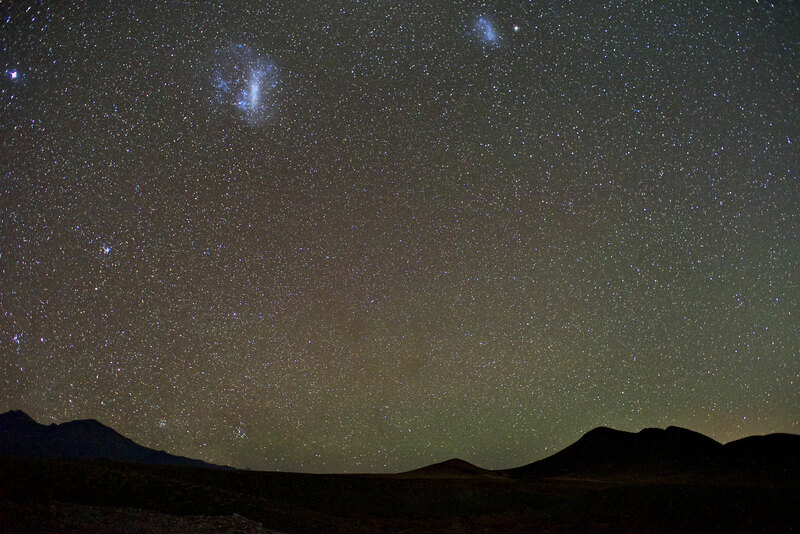 Since they are green, there are more clouds, especially during the winter and in the Valle del Elqui, located just outside the driest part of the desert. During winter, then, it is not so rare to have clouds (and sometimes rain), but for the 65% of the time the sky remains clear. 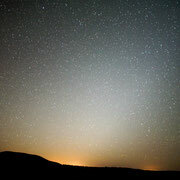 For both locations, the sky is very good, with a SQM values that can arrive also to 22. I personally measured steady values of 21.95 in many circumstances. Since we are in an oasis, the transparency is not as good as that you will find in the middle of the desert at high elevation. 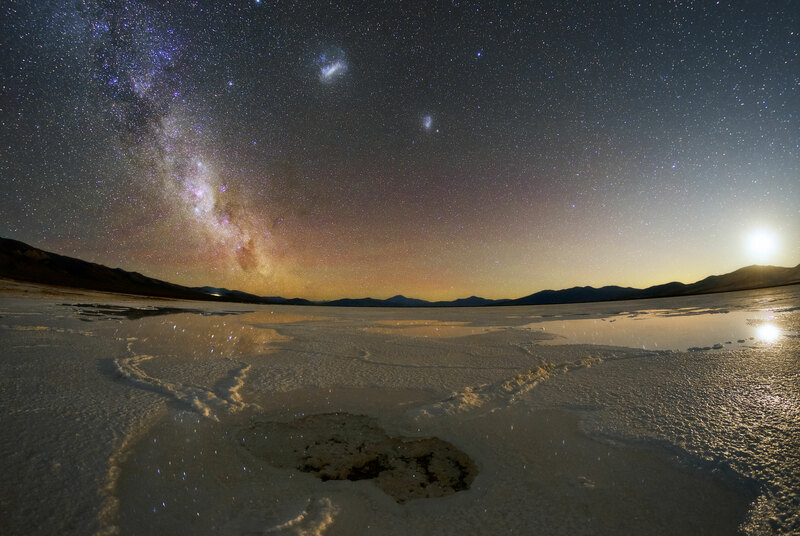 The presence of trees and mountains, however, contribute to create a total darkness effect that let you to believe to be in the darkest sky of the world. 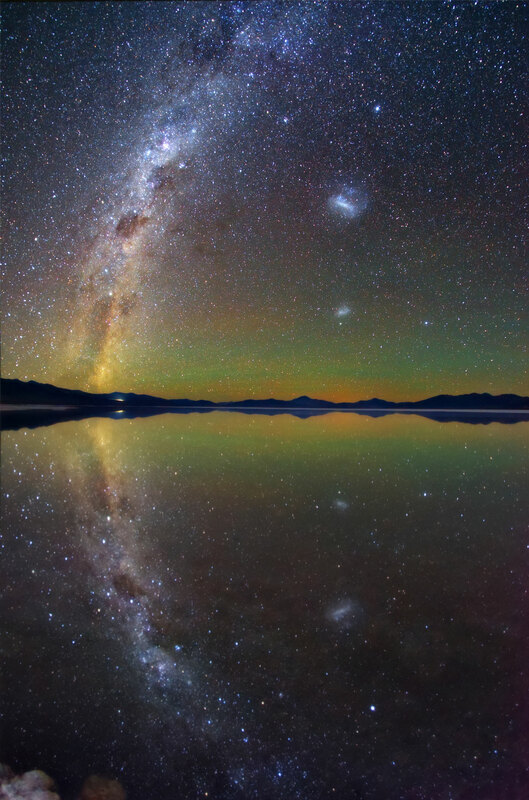 The humidity is relatively high in the second part of the night and this helps to perceive a very dark sky (dark but not so transparent) If you think to be in total darkness, under the best sky of the world, this could be just an illusion, but it's a good illusion! 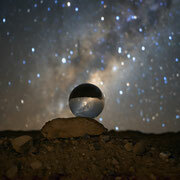 The seeing, due to the orography, is not the one that we are used to know for the Atacama desert. 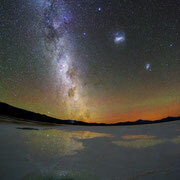 The places, indeed are suitable only for visual observations and to do wide field deep sky imaging. If you want to use a telescope, it's better to go into the desert. 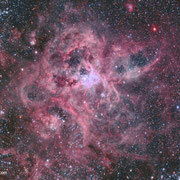 4) Possibility to find telescopes for rent and astronomical guides. 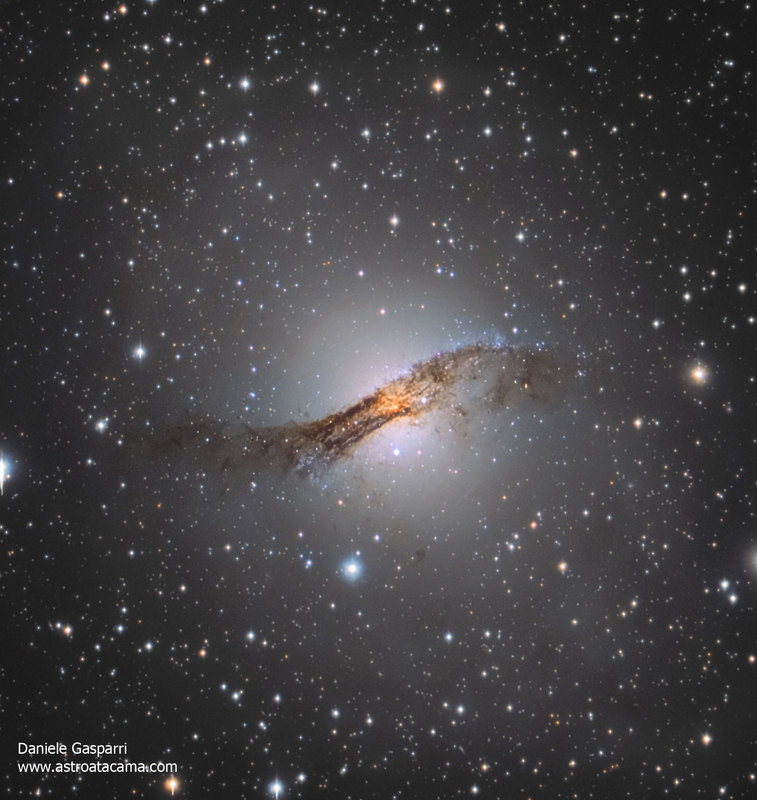 4) Not the best location to do telescopic imaging. 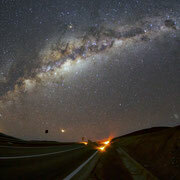 Anyone outside Chile knows the Atacama desert because of this small town called San Pedro de Atacama. The problem is that this town is not in the middle of the desert neither has the darkest sky. It has not even a very good climate, compared to the other locations of the desert! 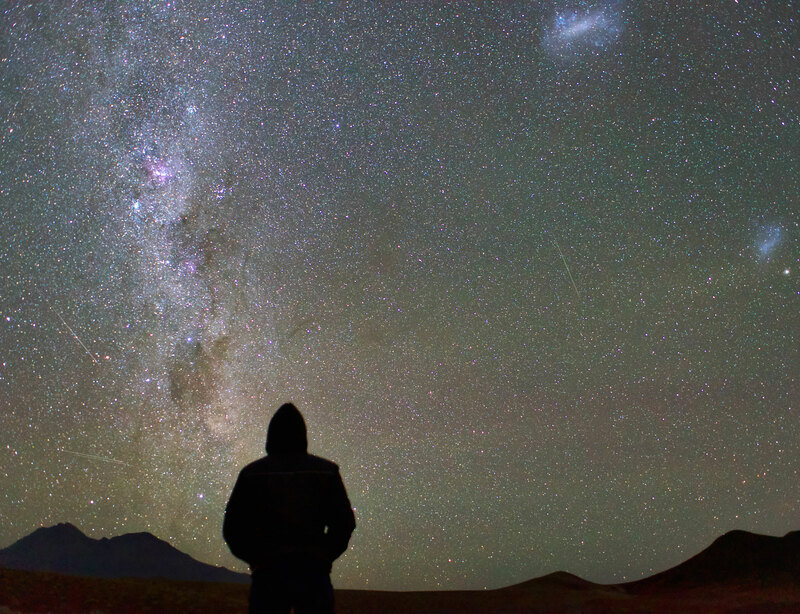 This is a good time to consider the power of communication: they sold you the myth of San Pedro de Atacama and now everyone in Europe and North America thinks that this is the best place to observe the sky. 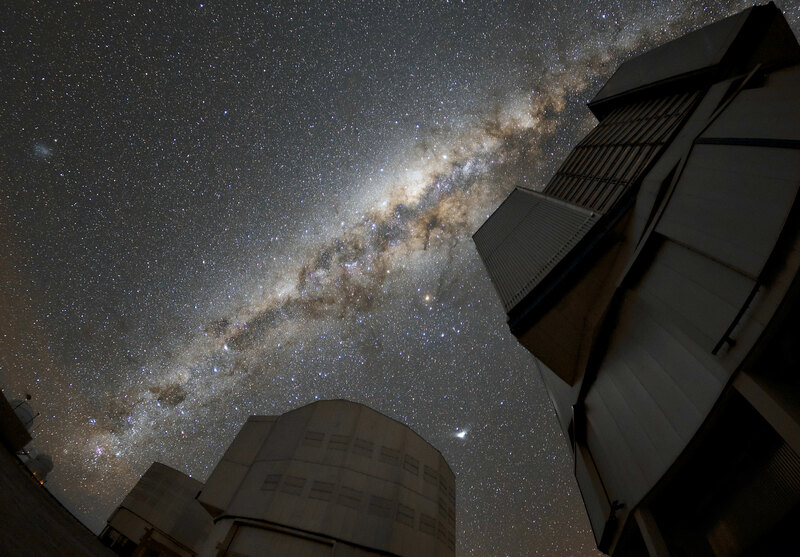 Anyway, the San Pedro de Atacama region has good skies and it is well organised with astronomical tours and telescopes for rent, so I wanted to include in my personal list, although it's not my favourite. 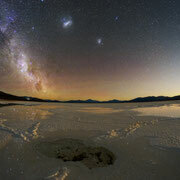 San Pedro de Atacama is located to the northern limit of the desert, close to the Cordillera de Los Andes. 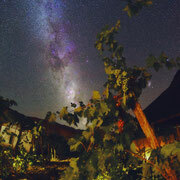 The town is small but well (or bad) illuminated, so it's better to go few kilometres away to have a good sky. A good alternative, if you are looking for tranquillity, is to go to a very small town, just 40 km to the east: Toconao: here you can observe the sky in a comfortable chair in the garden of your hotel room, not bad! Just few kilometres from Toconao, there is a sealed road that lead to a village called Talabre. The road is very panoramic, with a beautiful view on the valley. 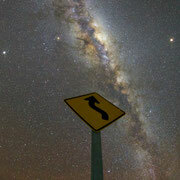 Before reaching Talabre, you will find some spot along the road to stop and make your astronomical observations. San Pedro and the towns around it, actually are so close to the Cordillera de Los Andes that the climate is influenced more by the mountains than by the desert. During the southern summer, around February and March, the region is usually interested by the winter of the plateau, known also as Bolivian Winter (because came from Bolivia, not much to the north). For some weeks we could see grey skies, rain and even snow. 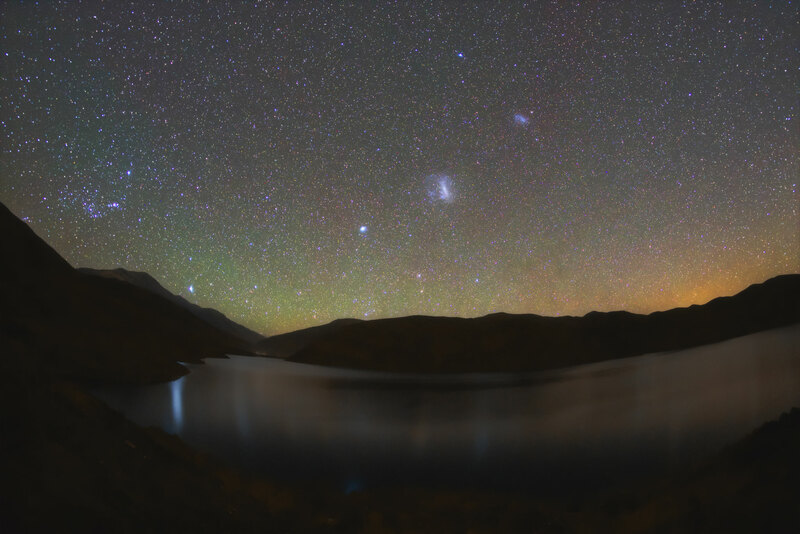 Also in the months of December and January the skies are not so clear, with the presence of high altitude clouds for 20 to 30% of the time. During the southern summer the skies remains steady, but considering that we are in the driest desert of the world, maybe we can find a better place and don't take the risk to have a whole cloudy week! 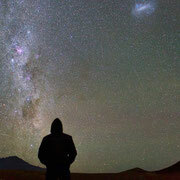 San Pedro de Atacama and the whole plateau are at 2500-2700 meters of altitude, so during the night it's cold. No humidity (when it's clear!) and usually the wind is calming down during the night, although is rare to have a perfect calm. The region around San Pedro de Atacama if rich in small town and huge mining companies that exploit the natural resources of this rich land. Although the sky is very dark, it's not the best we can find. All along the horizon we will see glow of light and even at the zenit we are not in the perfect darkness. SQM values rarely went above 21.8, with 21.5 in San Pedro. The seeing is good but not excellent. 3) Not steady weather conditions, compared to the other places of the desert.